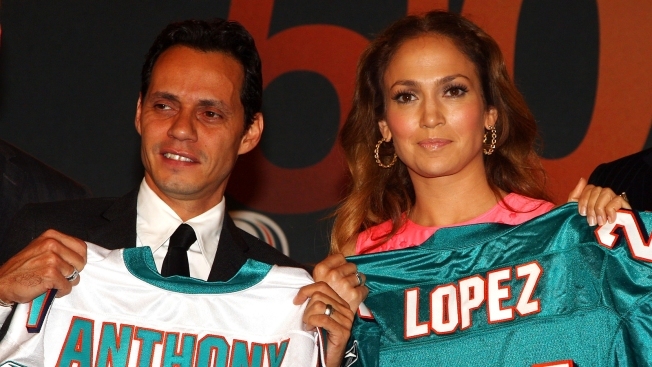 When Anthony's wife J.Lo is able to wear that aqua on special teams, then it's a major announcement. Another day, another "Major Announcement!" from Stephen Ross that means nothing to football fans in South Florida. Tuesday afternoon Ross was joined -- in New York City, mind you, not Miami Gardens -- by NFL Commissioner Roger Goodell, ESPN President George Bodenheimer, and singing salsa dip Marc Anthony to announce that Anthony is becoming a "limited partner" in the Dolphins. None of that matters in the world of Dolphins football, and that's the problem with Ross' celebrity obsession: Lindsay Lohan goes to rehab with less ado about nothing, and both events are hyped up and forced down our throats in equal measures (for all we suffered from the Land Shark naming deal, it didn't cost Jimmy Buffett a dime -- and the Gloria Estefan PR blitz was wrung from a sale of around 1%). Let's be clear: if the Dolphins experience any spike in ticket sales this coming season, it's because they're better on the field thanks to the crafty work of Bill Parcells and Tony Sparano, not because of latin-flavored halftime performances or boozy island-contrivance-themed fight songs. Citizens of South Florida aren't looking to Dolphins Stadium (you heard me) for anything but 1972 Part II: The Rise of One or Both Chads, and the Latin Grammys aren't looking to start a new category in "sports ownership." This is football. What fans want is blood on the field, affordable tickets, and shorter lines for the bathroom. We know that, because that's what they say. The more accessible -- and enjoyable -- games are, the more people will come. The Dolphins with Marc Anthony and Gloria Estefan are nothing compared to what the Dolphins could be with free parking or a cheap family pack with seats that aren't located in Palm Beach County -- or, obviously, a team with a great record and a shot at a division title. Don't get me wrong; it's lovely that Ross wants minority owners, and that minorities are owners. And perhaps it helps with merchandise sales. But this isn't the Miami that experienced its first wave of growth -- kids growing up in Miami with Hispanic parents are not much different than children growing up in Miami with Caucasian parents, so the transparent targeted marketing feels a little stale. And we're all just gonna go to the bathroom at halftime, anyway. Congrats, Mr. Anthony, sincerely. You'll enjoy your ownership a lot more than we will. Janie Campbell doesn't care if Mr. Potato Head gets a stake so long as she doesn't have to listen to any Fins-themed songs he writes. Her work has appeared in irreverent sports sites around the Internet.